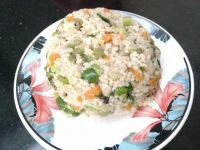 It is a quick flavourful rice variety best suited for parties. Tastes fabulous with manchurian. 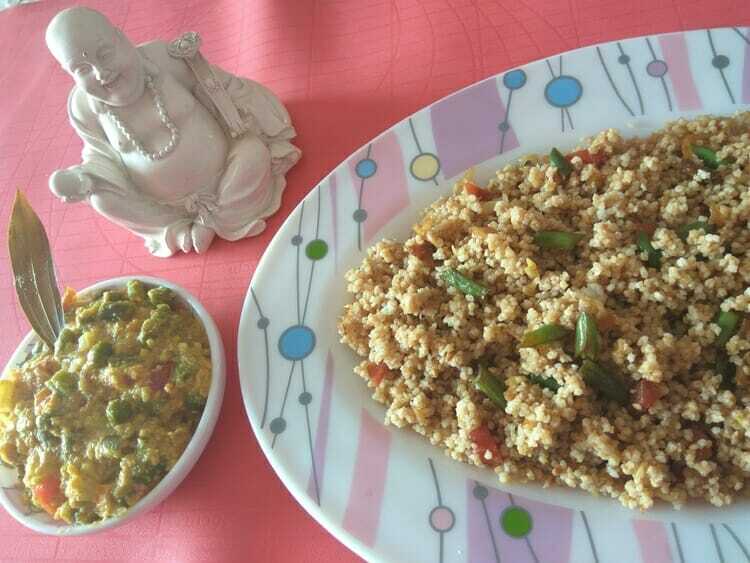 I made veg kuruma as an accompaniment. Both are OPOS dishes. In a 2 ltr. Pressure Cooker, layer oil, chopped garlic, veggies, spices, sauce and vineger. Mix in cooked and cooled millet rice. The Kuruma is also prepared in minutes by OPOS. And believe me, you will never go back to traditional method for making this tasty and flavourful kuruma. Blend all the ingredients given under the heading ‘Blend’ to a smooth paste. Mix all the items given under the heading ‘Ingredients’, except onion and tomato. In a 2 Ltr Pressure Cooker, layer 2 tbsp water, 1 tbsp ghee, onion, tomato, vegetables and coconut paste. Cook on high for 4 to 6 whistles. Open and mix in 1 cup milk. Mam……want to try this recipe,What’s the procedure to cook barnyard millet . As mentioned I agree that it is a quick and flavourfull party dish. The tangy taste of vinegar and soya sauce gets infused in each and every grain quickly through this opos method. I would suggest varagu arisi for any variety rice that is mentioned here as it doesn’t turn mushy and can be treated on par with Basmathi rice. Another validation from you! BGR looks fantastic and I am sure, kids would have enjoyed it! Thanks for visiting! You can make everything with millets! Do try some recipes and share your experience. This recipe was trie and validated by one person who will share her experience shortly.